A jubilant Everest Masters team. 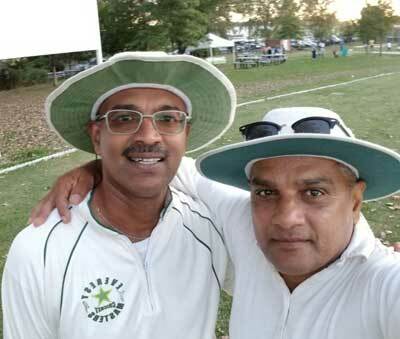 Shahid Shahzad delivered a sterling performance in the New York Masters Final at Idlewild last Saturday against Village Rams with a brilliantly measured inning of 113 runs, where he followed up his spectacular 141 against Bleachers in the semi-finals, as defending Everest withstood a withering riposte from Village Rams batsman, Royston Trocard, the former St. Maarten nation player, to seal their third championship. The final margin of victory, 24 runs, may have been comfortable for Everest in the end, but it required two sparkling performances from Shahzad and Sohan Dass to put their team’s total beyond the range of a spirited Village Rams side. Everest has rallied with impressive resolve throughout the season, but for some reason, they found a way to feed an unhealthy dose of complacency and have grown more thorns than they were willing to pluck. Their only period of comfortably, in a hard fought contest, except for the last three overs of the match, came with a dogged third wicket partnership of 107 runs between Shahzad and Sohan Dass – the former Guyana Nation player, whose rare appearance up the order has answered many in the affirmative with a classy 48 runs, and one that seriously exposed the contrived ‘short-sightedness’ of his ability. Dass appearance at up the order came after a numbing decision by Village Rams to send Everest in to bat after they witnessed a more formidable Bleachers team paid dearly in the semi-finals, Everest 288 for 4, on this venue, a week ago for, doing the same. But briefly, in the opening spell, Rams grazed happily as Everest limped to 34 off 8 overs before S. Mohan was again relieved of the burden, and two deliveries later Debo Sankar drove loosely to point, 34 for 2. Sankar has had a series of good opening partnership with Shahzad, including 72 runs in the semi-finals, and was bemused at an ill-conceived move to break up the opening combination for one that made room for a ‘sixteen-ranked’ on a ten man squad. To do things a little differently in the context of this final not only established a false sense of authority or superiority but a grave miscalculation for a makeshift opener. 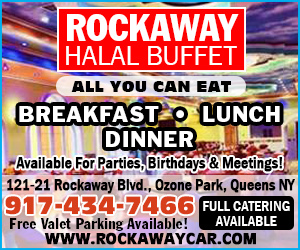 It did not work, and never will, if anything it will succeed in further deepening the disconnect that has been lurking, but stranger things have happened in the New York cricket world these days. Remember, Everest’s Masters entire team was on probation this season, and perhaps still is, for not cooling the sun. Shahzad, on the other hand, was clearly in strange company, and so too were a majority of his teammates. The lack of communication in the middle was evident, but then he breathes a sigh of relief in partner with Dass. They combined with a sculptures patience and chip away at the opposition’s attack in a very crucial stand that glued together a firm platform for the Everest inning, while grinding the opposition in the heat. Surprisingly, Dass’s aggression overshadowed his partner as he began his inning with three crisply executed boundaries; a pull to backward square and then a thumping straight drive of rare brutality that sounded on the side screen on one bounce, both off Myers. In the next over he cuffed Williamson impudently over mid-wicket for a massive six. Shahzad can equal that, and he did in the next over, he pulled Williamson to square leg boundary, and swept him disdainfully over midwicket for six off successive deliveries. He then spanked Cutbert Mendonca for a dismissive maximum over wide mid-on, and a productive three overs eased the pressure and the partnership was beginning to shift gears. Alternatively, in this final, Shahzad toiled as he has done all season with an unbelievable sense of determination. He mapped his inning in a stony occupation of the crease realizing that every runs Everest scored was a step closer to another championship, while making an unintentional mockery of that fishing ‘probation’ thing skites, and allowed himself a show of defiance with every maximum. At 141 for 2 in the 22nd over, Everest was in a commanding position before Dass holed out on the square-leg boundary. Vijay Seonarine followed immediately when he sliced to point, 141 for 4. In this final Everest found reason for loosing wickets in pairs, at crucial times, and it stifled their aggression. An important 5th wicket partnership of 60 runs between Shahzad and Zamin Amin took Everest to 201 in the 30th over before Shahzad holed out on the mid-on boundary for a brilliant 113 runs(10 4’s, 4 6’s). It was the kind of officiating that continues to feed that demon of distrust which hangs over umpires, and one that gives the rest of the umpires, with a badge, a bad name. It is also the kind of officiating, and reaction that leaves cricketers with a rancid taste, and one that serves the game absolutely no good. In the end, Everest team was put on something called probation for a year. How preposterous, but for those who do not care for the game that was yesterday’s bad news, especially if one is hell bent on polishing a convenient conclusion just to show authority. As such, and it may be good wisdom, in some corners that aiding and abetting rogue officiating has some temporary rewards, and that there is an addictive satisfaction that one gets by wholly basking in the glory of punishing a team by glamorizing mediocrity. Unfortunately, in this fractured environment of New York cricket, that seems to be the order, and is truth of it all at every sunset on a Sunday afternoon. By now one must have sensed the grave disrespect shown to the Everest Masters team with a vile decision that has cloaked more repugnant reasons than one can imagine. Everest though, remained true to their values and undeterred by anything that was thrown at them by quietly chalking up one victory at a time to the final leaving the irrelevance of that probation thing where it belongs. Conversely, It is unfathomable to think of a more poorly executed act (a year probation) by men against men, who at an age, may fret as the wind blows or cannot pull their pants up high enough. And many who may find more comfort with knee wraps, ice packs, and bengay, (the norm at this age, in this sport) have not turned that corner, as yet, with only a few mornings of life left to play a sport which they are all addicted to. As for the trophy, that too was on probation, and the man on top of it must be old by now, and fretting ‘tek me down, me col’ and badly in need of some polish. And after that tangent, Everest’s lower order was in a rush for some gravy, Amin and Mohamed both went with the score on 229, as the last five overs yielded a vital 44 runs before the inning closed on a commanding 245 all out in the allotted 35 overs, with Amin getting 30, Mohamed 12. Keith Sang, who surprisingly bowled only three overs in this match and was poorly underused, bagged 3 for 20. L. Williamson 2 for 41, W. Myers 2 for 27, C. Mendonca 1 for 44. 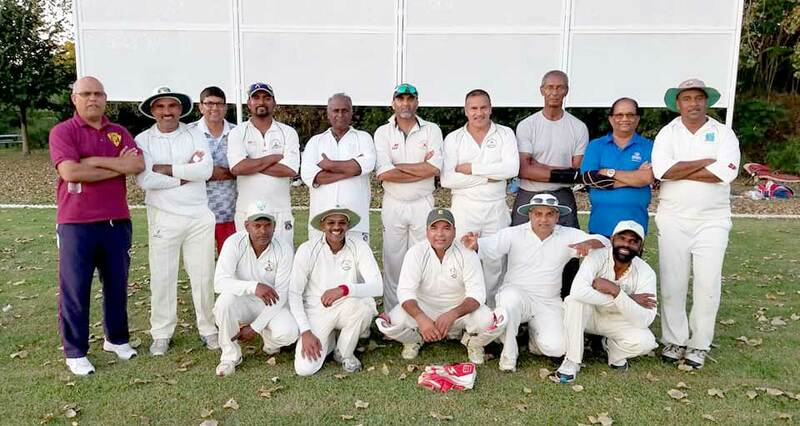 Village Rams, in their reply, never presented any serious challenge, albeit spirited at times, to the total as Everest bowling attack strategically chiseled away at their top order. Everest went into this match without their ace pacer, Trevor Walke, who is still recovering from a hand injury he suffered after falling in the semi-finals. Dass has had few outings with the ball so far and was trusted with the new cherry to partner Sham Ali. Ali, who for ‘some reason’ appeared out-of-sorts in a brief spell, and a few sparks that almost didn’t happen in this match. But this final has had its fair share of explosions and excitement thus far. With all eyes on Everest’s’ marked man, David Mohamed, who exercised an unbridled sense of calm in this high drama contest, and subsequently shut-up the naysayers and buried this opposition with his input, experience, and a stingy spell in the middle including the prize wicket of Trocard. With Royo benched for maybe the lack of association and ‘striking power’ of sorts, and some serious striking power in two classic centuries from Shahzad and Trocard. And yet, had it not been for a less notably celebrated performance, Everest’s eventual 24 runs win would have been significantly less comfortable and perhaps in some doubt. Instead once the dust settled on a pulsating afternoon of high class masterclass Masters cricket that witnessed centuries on either side of the inning, there was the ‘invisible’ figure of the burly Sohan Dass. Standing (L to R) : Haseeb Sheriff, Zamin Amin, Iqbal Sheriff, Vijay Seonarine, Sohan Dass, Shahid Shahzad, David Mohamed, Trevor Walke, Mahindro Jainarine, Selwyn Mohan. Sitting (L to R): Lincoln Deonarine, Sham Ali, Cyril Choy, Debo Sankar, Gilbert Bartholomew. He sent down a lion-hearted opening spell that accounted for D. Morand by the sheer brilliance of Vijay Seonarine at cover. A full-blooded drive that swerved away inches off the ground to Seonarine’s right, and somehow he held on just as the ball had passed him, that boy ‘skurs’ can catch a rocket! But Dass with his shirt breaking out of his trousers with every delivery and his 8-pack physique exposed for all the girls to admire was on show. He is not only a very dependable batsman, but a big occasion player who knows how to ply his trade, when given the opportunity, and he delivered on either side of the inning. Everest kept picking up wickets at regular intervals, and with the score on 109 for 3 in the 20th over with Morand, Myers, and Salmon back in the shade Village Rams’s tail was widely exposed. It could have been much worst for this opposition, if Sham Ali had held on to a sharp chance at short mid-wicket off Dass with Trocard was on 25. Mike and boys, sitting under the tree, kept reminding him for the rest of the match, and moreso, as the brown liquid was down to the last drop. It was costly drop catch that confirmed one of those echoes of having him on the bench. But Seonarine, Amin, and Mohamed combined to form a formidable force and marshalled the boys. Lincoln Deonarine and Gilbert Bartholomew had brief spells, while Feezo with his nerves racing was probably wondering why he was not on this team, yea right! With 136 still needed in the last 15 overs, Village Rams were heading to the abattoir. Trocard, however, can change that course. He was striking the ball with good authority and command, and asking some serious questions of the Everest’s attack. He lived a charmed life in Village Rams’s only notable partnership of 52 runs with Mendonca (10), before Mendonca picked out Sankar on the mid-on boundary There were some glimmer of hope still remained that Trocard may pull off one of those death overs heroics staring at 58 runs to get in the last 5 overs. Unfortunately, that’s all it was, just a glimmer of hope as David Mohamed out-foxed Trocard’s charge, and Cyril Choy did only one thing in this match, and the most important, dragging a wide from outside the off-stump and picked off a brilliant stumping to end an entertaining century form Royston Trocard that included 9 4’s and 4 6’s. His departure with the score on 188 for 7 in the 31st over opened the door to the abattoir and ultimately wrote the last rights of Village Rams. Feezo and crew looked relaxed now. Everest bowlers were outstanding in this final with D. Mohamed taking 3 for 29, S. Dass 1 for 37, V. Seonarine 2 for 29, and Z. Amin 2 for 42. Umpires Ashley Green and Carl Patrick held a firm grip on this final, and officiated this match to the standard expected of qualified umpires, and as such, they must be commended on an excellent game, and Austin Hutchinson, for making sure that the Idlewild field was in prime order, and taking care of the two teams almost single handedly. 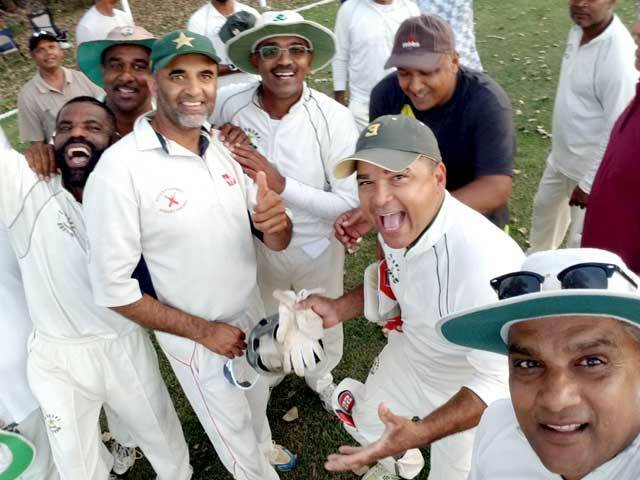 Everest Masters has once again proven their worth as a very experienced team, one that brings a high quality of cricket, sportsmanship, and discipline to the league. After a game was taken away (6 points plus two additional points penalty) Everest Masters rallied against the odds to secure a spot in the semis. But it was Bob Marley who said “Rise up this morning, and smile with the rising sun.” And so, in this final, a team that has shone ever so brightly throughout the season, remained steady in the shadows of the setting sun, in the late afternoon at Idlewild, and buttoned-up this final with a convincing 24 runs victory and another championship.